JSS students are usually less confident about expressing themselves through writing because the language of their everyday speech differs greatly from that of written texts. They may have limited vocabulary and skills in punctuation, be less practised in producing original answers to comprehension questions and have little familiarity with producing original compositions. However, their confidence can grow through practice in expanding their range of vocabulary and teaching them better grammar and punctuation skills. This unit provides some ways to help develop your students’ spelling, grammar and punctuation skills. develop your students’ confidence in communicating through writing. Words and phrases that help signal the progression of ideas in a text. Semantic markers can perform various functions, such as showing the chronology of events (firstly, then, eventually, in the end), a cause and effect relationship (since, because, so, consequently), summing up (in short, to sum up), rephrasing (in other words) and so on. These expressions help a reader to navigate easily through a text. The context of a word can be either physical or linguistic. The physical context refers to the real-world situation in which the word is used, as in “horrible weather” (i.e., bad weather — when it’s raining heavily). The linguistic context refers to the words or sentences surrounding the word that help to make its meaning clear, as in “I don’t know what’s happening to me... I seem to be making mistakes all the time! It’s horrible! I think I need to take a break” (horrible here referring to some unhappy circumstances). A written text that may be a fictional or factual account of an event described in chronological order. A narrative usually has a clear beginning, middle and end, and includes descriptions, dialogues and comments. Novels, short stories, travelogues and biographies are some examples of narratives. When two words cannot be used together to make a meaningful unit, we say that they have collocational restrictions. For example, the collocation married spinster is unacceptable, as are the phrases smiling computer or manicured hair. These combinations ignore collocational restrictions on grammar and meaning. A spinster is an unmarried woman, a computer is inanimate and hence cannot smile, and unlike nails or gardens, hair cannot be manicured. Collocation therefore refers to the appropriate use of a combination of words. One of the interesting things about the English language is that there is often little correspondence between the spoken and the written form. This means that many words in English — for example, write, women, sight and white —are pronounced differently from how they are spelt. Sometimes the meaning that is conveyed depends on the spelling or the arrangements of the words. Words like write, right and rite, or sight, cite and site have different meanings, but are pronounced the same. Similarly, the same sound may be spelt in different ways — for example, the sound “sh(u)n” in mission and addition (see Resource 2: Commonly misspelled English words. Or the same sequence of letters may be pronounced differently in different words — for example, the sequence ough, which has a different pronunciation in rough (“ruff”), though (“thoa”), through (“throo”) and thought (“thot”). These characteristics of English are a challenge to many students in secondary school. The case study, resources and activities in this unit should help you use interesting activities to develop students’ effective writing skills. Mrs Mwemezi, the English Language teacher at Kabanga Secondary School consulted her scheme of work and found that her next topic was “Developing Better Writing.” She decided to use guided/controlled activities to teach this topic. To make the lessons more interactive she planned to use a variety of techniques including dictation, conversation and stories. In the first lesson Mrs Mwemezi gave her students a passage she had carefully picked from a book for them to read in pairs. She asked the students to underline all the words that they did not understand. She then wrote the problem words on the board, and asked for the meanings from the other groups. She repeated the exercise for each group, until they had about 20 words on the board that were unfamiliar to all the students. Mrs Mwemezi now practised with the students the strategy of “guessing meaning from the context.” For each word, she wrote a sentence that used the word in an appropriate context (for example, The contours of this landscape are very interesting... sometimes the land goes up and down, and sometimes it breaks into deep valleys). The class was now asked to supply possible meanings. Amid laughter and competition, the class came up with appropriate synonyms after several wrong guesses (contours = quality, beauty, barriers, shape, etc.) for eight of the words. Having exhausted this resource, Mrs Mwemezi now used the next strategy. share their findings with the class. For homework, Mrs Mwemezi asked each student to think about the possible heading of the passage. She also asked them to note the important information they got from the passage. In addition, she gave them a list of commonly misspelled words (see Resource 2) so that they could improve their vocabulary skills as well. In the next class, Mrs Mwemezi had the students write short summaries of the passage using some of the new words they had learned. The students enjoyed the exercise, and informed her that it would now be easy for them to remember and use those words in other compositions later on. What strategies do you use to help your students understand the meanings of unfamiliar words? How effective do you think it is to ask your students to refer to a dictionary every time they encounter a new word? If you have encouraged students to do this, has it helped them improve their vocabulary? Adjectives of quality are a class of words used widely in narrative and descriptive texts. They are used for describing people, objects and events. However, most English adjectives have collocational restrictions. For instance, the adjective meticulous will collocate with the nouns planning, embroidery or work, but is unlikely to be used with the noun vocabulary, as in the phrase meticulous vocabulary. This activity is meant to help you develop the students’ skills in creative composition with exercises on using adjectives of quality. As a pre-task, show the students a picture of any object (an umbrella/a car/some scenery, etc.) and ask them randomly to use an adjective to describe it. For example, they might say red/spotted/large/frilled/ladies’/silk umbrella. Remind them that such adjectives are called adjectives of quality as they tell us more of the distinctive characteristics of the object (umbrella). Pick up any adjective from the ones supplied (e.g., red) and ask the students to replace it with synonyms. Encourage them to use words that are creative and interesting (scarlet/crimson/fiery red/tomato red, etc.). Discuss with them the special meanings that arise with each new synonym, and how one can use language creatively by using adjectives of quality appropriately. Now divide the class into groups of five or six and distribute the passage in Resource 1. Instruct the groups to replace the underlined adjectives with appropriate and interesting synonyms. Allow them to use a dictionary or thesaurus to be creative. After they finish, ask them to present the passages with the new adjectives. Discuss how each new version makes the passage more interesting. As a homework assignment, ask the students to write a similar composition using the words they have just learned. This will help them improve their active vocabulary. A bear eats shoots and leaves. Call their attention to how punctuation marks such as commas and semi-colons can change the meaning in sentences and longer passages. You can highlight the fact that being able to use punctuation skilfully is a part of effective writing. Now announce that you are going to test the students’ punctuation skills, and put them in groups of four or five. Put on the board the following sentences from Resource 3a: The Tortoise Story (extracts), note that these have no commas and speech marks. Alternatively, you can ask them to copy the lines, or distribute the text in a handout. One day as he was strutting proudly around the kingdom Hare met Tortoise carrying a heavy load on her head. Old bag of bones Hare said get out of my way before I push you off the path. The task for each group is to put commas and speech marks (quotation marks) wherever appropriate as they listen to you read the lines. Play the audio clip of these lines, or read the lines aloud (paying attention to the punctuation). After the students have finished the task, give them oral feedback. First read the lines again, but more slowly, pausing longer at commas and animating your facial expressions as you read the dialogue. Ask them to make corrections if they wish as they listen the second time, then have the groups do peer correction, while you punctuate the lines on the board. If you wish to give them more practice, use different extracts from passages that illustrate the use of other punctuation marks such as the colon, dash, exclamations and so on. 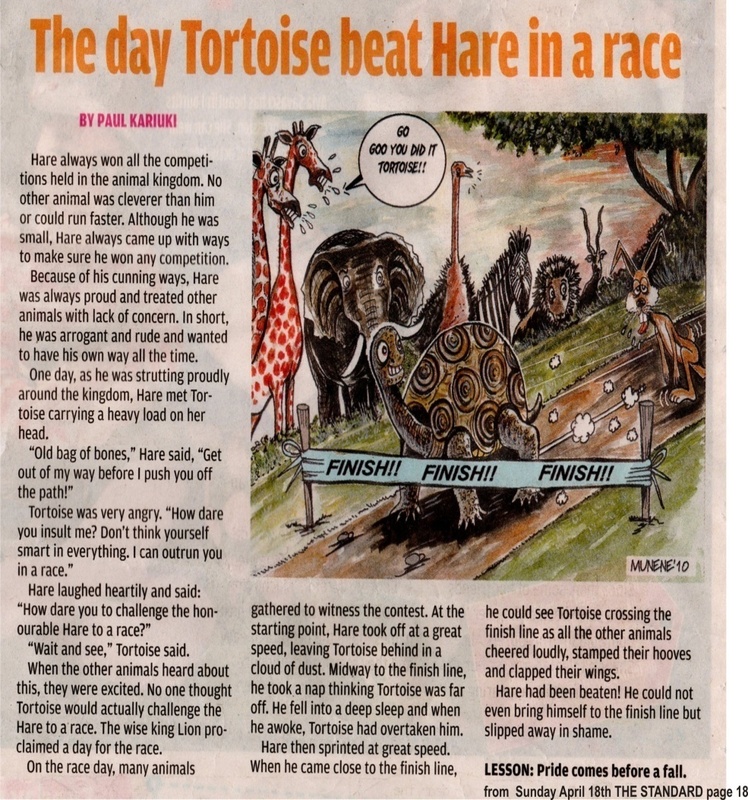 Finally, give the students the first seven paragraphs of The Tortoise Story (up to “Wait and see,” Tortoise said.) without punctuation, and ask them to read and punctuate the passage appropriately. After they have done so, play the audio version of the seven paragraphs (Resource 3b). As a homework task, you can ask your students to write and bring to the class a short story (not more than three paragraphs) on a popular folk tale similar to The Tortoise Story, or have them make up their own story, with at least two characters and dialogue between them. As you are aware, in any text, whether spoken or written, linkers and connectives (some of which are also sometimes called semantic markers) act like signposts that help us navigate through the text. Expressions like firstly, meanwhile, however, in other words or in short help us understand the links between ideas, concepts and arguments in a text. To write effectively, your students need to learn how to use such markers for maximum effect. Before having the students use linkers in their own compositions, it would be helpful to familiarise them with the functions of such connecting devices. For functions of semantic markers, see Resource 4. Announce to the class that they will hear two telecasts of the first news item of the evening news. As they listen, they will have to guess the differences between the two telecasts. Now play the video of two newscasters reading the evening news on television. If you cannot play the video, read aloud the transcripts of the news (see Resource 5: Examples of semantic markers) and ask the students to note the differences. Ask them which version they understood better, or found more interesting, and why. They should be able to tell you that the second version was better because the information was easier to follow because of the extra words used in this version. Before explaining or drawing their attention to the functions of semantic markers, give them another task on the texts to help them identify the linkers and semantic markers used. This one is a dictation task. Give the transcripts to the students in the form of a handout or write or display it to them on a slide or chalkboard. Remember to replace the words in bold in Text 2 with dashes before you distribute the texts. Before you begin the dictation, explain to the students that they should read both the texts in the handout carefully before doing the task. Their task would be to fill in the blanks by inserting the expressions they hear when you dictate Text 2. Now give them as a handout a passage from any of their subject textbooks, preferably a History or English literature textbook, that have some of these semantic markers, but delete the markers. Ask the students to work in pairs to discuss and fill in the appropriate semantic markers. Compare their insertions with the original text, and have a class discussion on which ones are appropriate and why. After taking the students through this process of understanding the use of semantic markers, give them a homework assignment to write a short passage, either (i) a description of a memorable personal event, or (ii) a short essay on the advantages and disadvantages of using computers. Remind them to use the appropriate semantic markers. They can consult the list given in Resource 4 or use their own. In this unit you learned how to guide your students to expand their vocabulary, use correct punctuation and present their ideas and information in written form more clearly using linkers and semantic markers. These resources should give you ideas for engaging your students in similar activities in pairs and groups to practise other aspects of written communication such as writing in formal and informal situations. Did your students enjoy doing the activities? Do you think your students can now use punctuation more skilfully? Can you think of other activities to improve your students’ vocabulary? Some common word games that your students might enjoy playing for vocabulary expansion are crossword puzzles, anagrams and guessing words from actions (dumb charades). Do you agree that students need to understand the functions of semantic markers and use them in their written work? In the case study, if you were Mrs Mwemezi, what would you have done differently? Explain how this would have helped students learn better. The Incas of Peru were one of the most civilised races that lived on earth. They were a small ethnic group who came to rule an empire of more than 12 million people. They established their powerful empire in Cuzco in Peru and built their kingdom using splendid architectural designs. The Incas were also skilled craftsmen who created beautiful jewellery and textiles. They were able administrators who ruled with a mixture of force and kindness. They were also tolerant rulers, and allowed people of different races to practise their religions and cultures peacefully. Things changed, however, when the Spanish conquerors arrived in 1532. With an army of fewer than 400 men, the cunning Spanish defeated the Inca army of 40,000 soldiers. Then the vicious conquerors began looting and plundering the riches of the Inca culture. Most of the amazing architecture and intricate buildings the Incas had carefully built were torn down and replaced by Spanish-style palaces and fortresses. Luckily for the world, one astonishing discovery was made in 1911 of a splendid piece of Inca architecture. It was of Machu Picchu, the temple of the sun god. This magnificent Inca memorial stands at the top of a mountain near the Urubamba river in Peru. The Incas did not survive, but their temple remains a glorious tribute to their civilization: a timeless memorial of the greatness of a people we can only read about in history books. Spelling words correctly is one of the skills of effective writing. Some words may change their meaning if spelled differently (live/leave; write/right; assent/ascent) which could make the text meaningless. Because many pairs of words in English are pronounced the same, people often confuse their spellings and use such words in the wrong contexts. People also often misspell words with double letters. Here are some commonly misspelled English words. One day as he was strutting proudly around the kingdom, Hare met Tortoise carrying a heavy load on her head. Old bag of bones, Hare said, get out of my way before I push you off the path. Hare always won all the competitions held in the animal kingdom. No other animal was cleverer than him or could run faster. Although he was small, Hare always came up with ways to make sure he won any competition. Because of his cunning ways, Hare was always proud and treated other animals with lack of concern. In short, he was arrogant and rude and wanted to have his own way all the time. One day, as he was strutting proudly around the kingdom, Hare met Tortoise carrying a heavy load on her head. “Wait and see,” Tortoise said. Semantic markers are important cohesive devices that serve as “signposts” to connect ideas in any piece of writing. List of points (firstly, secondly, finally). Time relationships (next, then, eventually). Illustration (for example, for instance). Emphasis (a crucial point is, importantly). Expressing a condition (if, unless, until). Counter-arguments or contrasts (but, however, on the other hand). Summary or conclusion (to sum up, the gist of it is). For more information on the use of semantic markers (also referred to as discourse markers) look up Wallace, Michael J. (2009). Study Skills in English (Second Edition). Cambridge: Cambridge University Press. The prime minister announced that the Commonwealth Games would be held smoothly, despite delays in the preparation of venues. Construction rubble would be cleared from roads by the end of this month. The Sports Ministry has called for a high-level meeting on Monday to discuss the final touches to the Games. There would be three levels of activity, a spokesperson for the ministry told this channel. A team of top security experts would visit the venue to seal all entries. International observers for the Games would inspect the facilities. The prime minister would visit the stadia before declaring the Games venues ready. The ministry stated work on the venues would be halted. It wanted the contractors to clear all venues and roads of the construction waste and heavy machinery that still blocked many of the main streets of the city. It would cause delay. The ministry believed the Games would begin on time. Everything would be done to make this Commonwealth Games the greatest sports event ever organised by a Third World country. The prime minister today announced that the Commonwealth Games would be held smoothly, despite delays in the preparation of venues. He also made it clear that construction rubble would be cleared from roads by the end of this month. Meanwhile, the Sports Ministry has called for a high-level meeting on Monday to discuss the final touches to the Games. There would be three levels of activity, a spokesperson for the ministry told this channel today. Firstly, a team of top security experts would visit the venue to seal all entries. After that, international observers for the Games would inspect the facilities, and finally, the prime minister would himself visit the stadia before declaring the Games venues ready. However, the ministry added, work on the venues would be halted next week, as it wanted the contractors to clear all venues and roads of the construction waste and heavy machinery that still blocked many of the main streets of the city. In spite of the delay that might cause, the ministry believed that the Games would begin on time. In short, everything would be done to make this Commonwealth Games the greatest sports event ever organised by a Third World country. Question: How can I use the audio resources when I do not have any audio equipment? Answer: Your voice or your students’ voices are good audio resources. You may read the script aloud or ask one of your students to read it aloud to his or her classmates.